Today is our national holiday honoring the courage, vision, and service of the Reverand Dr. Martin Luther King, Jr. Thank goodness the day hasn't yet been turned into an opportunity to hold another appliance sale. The movement to make it a day of service is fine, but we should also remember that Dr. King was an activist. His marches, his speeches, his organizing, his coordinatinng with other groups, his lobbying, ... all these actions, many done in very difficult circumstances and under threat of death, led millions to a new understanding of the power of the people. Being an activist is serving others. We can give people food and we can fight to change the system that keeps people hungry. We can march for funding for medical research and we can work for a society where drug company executives do not earn million dollar bonuses for raising the prices of vital life-saving drugs. We can donate school supplies for children whose families can't afford them and we can work to elect leaders who working to make the gap between rich and poor narrower not wider. So, please attend tonight's tribune to Dr. Martin Luther King, Jr. at 7 p.m. at Viterbo University's Fine Arts Center and then plan to work on the many other important issues facing our community and our world. 9:00 a.m. Get training to help people do their taxes through the AARP tax assistance program. Training for intake volunteers and for tax helpers will be at the La Crosse Public Library. 6:00 p.m. Washburn Neighborhood Assn monthly meeting at Lincoln Middle School. They'll be talking about a possible painted bike path on Jackson Street. 6:30 p.m. GENA monthly meetint at Emerson Elementary School. noon Values vs. Conventional Wisdom a talk with lunch hosted by local interfaith leaders at the English Lutheran Church (16th & King). Please RSVP at link for free lunch. 6:45 p.m. Powell-Poage-Hamilton Neighborhood Assn meeting to talk about the plans for a Jackson Street bike lane. 6:30 p.m. La Crosse Citizens' Climate Lobby monthly meeting will be at 401 West Ave South. 6:00 p.m. La Crosse Area Freethought Society holds its monthly Think & Drink at JavaVino. 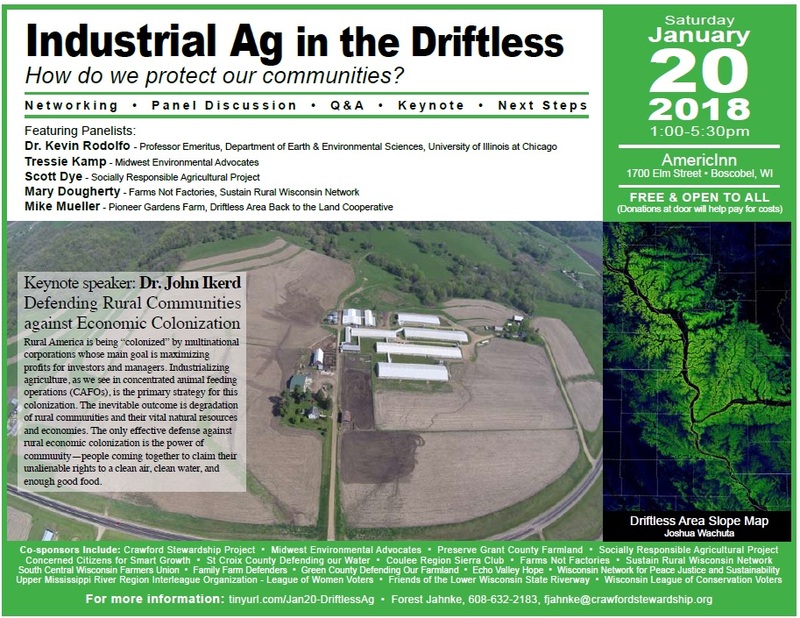 1:00 p.m. INDUSTRIAL AG IN THE DRIFTLESS - How do we protect our communities? 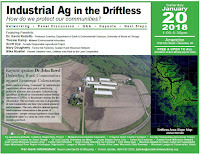 is a citizens' conference to address the environmental, economic, and community destruction caused by industrial size ag operations in local rural areas. This event is in Boscobel but it's super important to learn what's happening as large animal feeding operations pollute our wells and trout streams, ruin our roads, pollute our air, and threaten our economies. Keynoter, Dr. John Ikerd, professor emeritus at University of Missouri will talk about Defending against rural colonization. 2:30 p.m. Hillview Urban Agriculture Vermiculture Tour at 921 Ferry Street. 4:00 p.m AND 7:00 p.m. Awareness Through Performance Privilege Unplugged VII The mission of Awareness through Performance is to promote greater consciousness around social justice, diversity, and climate issues on the UWL campus and beyond. Using the stage as our forum, we creatively challenge systems of privilege and oppression and strive to plant seeds of social responsibility, inspire critical thought, and spark a campus-wide conversation. Privilege Unplugged XII showcases the passions, stories, and perspectives of UWL student leaders who hope to create awareness around the topics of privilege and oppression. Shows are free and open to the public.